Our goal as professional organizers is to help people use the space in their homes and offices most effectively. This is often done with simple tools to help place and contain items. 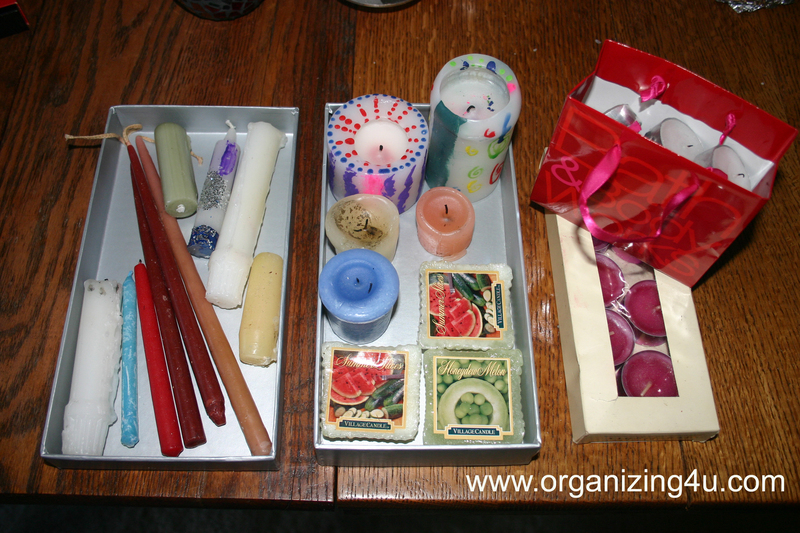 for our candle drawer, we used a small box, lid and a small shopping bag to contain various candles that were going back in the drawer. Read on for some more ideas…. Many home offices can improve space capacity with the addition of bookcases, a new and/or improved filing system and a system for long-term document retention. Think vertically when you enter the room and see how you might better utilize the space on the walls or in the closets. Closets are a challenge for many home owners; they come in all shapes and sizes, often without sufficient storage . Maximize the space using higher shelves for out of season clothes, hats or handbags. Don’t have any shelves? Try adding them! “Small bedrooms can be a challenge as well”, says interior designer Diana Hudson of Devine Designs. “Often these rooms are designated as a child’s room and there is an opportunity to make them fun and efficient. Use the vertical space for an elevated bed with a desk beneath it. Or try bookshelves and benches with storage inside for clothes or toys”. Kitchens are a fun place to be creative with storage while using your space effectively. Many catalogs offer pretty containers for food and pantry items, baskets can be used for utenstils, pots can be hung on racks from the ceiling and there are many varieties of spice racks to suit your needs. Clear containers are excellent for the refrigerator so the contents are identifiable! Garages, basements and attics are wonderful storage areas for items you do not need every day. Once again, think vertically when looking for extra space. Shelves which hang from the garage ceiling can dramatically increase the amount of storage in a garage. Sturdy shelving is available for basements or attics. We recommend using clear containers with labels so you can see what is in them with a quick glance. Use these tips to re-evaluate if you are maximizing your spaces and see if there is room for improvement! Inspired by these tips? Let us know what unique solution you have used.